The Bogey Golfer © is Martin Nielsen. 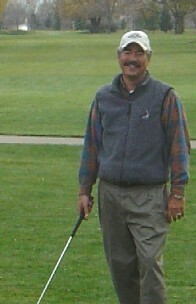 I first took up golf in 1987, right before the stock market crash. When the bottom fell out, I bought a hundred shares of my favorite stock, waited for the dead-cat bounce, immediately sold it, and bought my first set of clubs. I fight an outside-in swing path, and have a great deal of trouble with lag putts. Twice, I've holed an approach shot on a par 4 for an eagle (on the same hole! ), but haven't ever managed a hole-in-one.